It’s often said that you can’t blindly believe things on the Internet, but today in particular, TRUST. NO ONE. Except our definitive list of things that are confirmed April Fools’ jokes from the tech industry this year. Let’s have a look at some silly jokes, some terrible jokes, and some awful, ugly ones. We all get stuck in Reply All emails that we want to mute, but can’t. Gmail’s “Mic Drop” lets you say your piece and never see a reply from the thread again, which is genius (as long as you’re careful with the new Send button). Update: Google has disabled the button, because it was causing more trouble than the joke was worth – it also had a bug in some cases that would send a GIF even if you didn’t want to, according to TechCrunch. Ever get the feeling like Virtual Reality just doesn’t seem real enough to you? ThinkGeek’s version of a VR rig would be able to spray you with water, shoot stuff at you with a built-in projectile launcher, emit scent, and tickle you with cat arms if you so desire. Dorky, but cute. We made this joke before it was even April Fools’ Day, so it was obvious someone had to make this prank happen. Learn a language in your sleep? Duolingo, don’t kid around with stuff like this. I think we’d all pay the hell out of $99 to pick up a few new languages while we take our beauty rests. 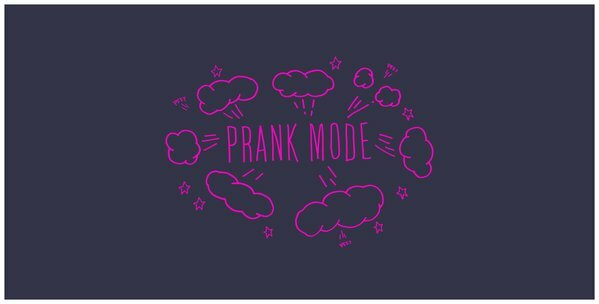 Lyft users in San Francisco, Los Angeles, and New York can plan ahead and request a Lyft to arrange a prank beforehand with the driver so they can do something strange to your friend during the ride. As if weird things didn’t happen on the regular with these car-sharing services, but hey, get in the spirit. Just in time for the season of people person with small hands (ahem), I would be down to purchase this pack of travel-sized Magic cards. Sure, it’s not like Magic had a huge mobility problem, I just like the idea of putting them near Donald Trump’s hands and looking like normal-sized cards. It even comes with tiny little counter tokens! One thing I know about the Internet is that people love miniaturized things. We’ve already seen actual levitating speakers out on the market, so this isn’t entirely out of the realm of possibility. Make them more compact, however, and you might have a product on your hands that hipsters would want and old people on buses hate. What good is a self-driving car if you still have to sit and monitor its path? That’s why this autonomous RV is the self-driving vehicle we actually want to live our true trailer lives. A voice-activated headlamp washer? We’ll take 20. Cab-hailing service Ola’s joke this year is instead of having cars come to you, you can hail mobile rooms on demand. It’s a hop, skip, and a jump away from hourly hotels. Gross. T-Mobile didn’t try too hard to make its prank upgrade to its video streaming service look convincing – but it did show us the worst possible head-mounted phone holder and take a potshot at its rivals for good measure. Google gets full points for hilariously parodying every tech video ever in a single clip. No, fanboys, you CANNOT buy this. I’m biased – I love me some corn and would watch the hell out of this. This is cute, but a little weak on the execution as it’s just a mocked up image. If they can make a video on autonomous RV driving around and responding to voice command, you’d think Honda can do more than get some graphics intern to slap emojis onto a product shot. Tech companies going retro is sort of an old joke, so Vimeo launching a second “product” as a zine is not totally unexpected. But extra points for recognizing their hipster userbase. Google Japan usually has adorable April Fools jokes – with Google Kazoo and a talking Panda from previous years – but this year it gets a bit more technical with the Flick keyboard. It enables you to add a flicking motion to any surface and make it type-able – even a head of cauliflower. Oh, Japan. It’s not a joke per se, but who doesn’t want to see Taylor Swift faceplant hard on a treadmill? Makes her whole spat about Apple Music seem so elaborate and forced, doesn’t it? Unlike Gmail’s Mic Drop (which was actually enabled, then disabled), YouTube has the SnoopaVision 360-degree view option on YouTube but it doesn’t actually work on most videos, just a handful. You can do better than this, Google. If you don’t want to talk to people when ordering your meals, why bother even type and search for anything at all? Deliveroo’s telepathic food order is the future. Again, not totally unexpected, but points for being relatable because dang, we’ve all been there. The 20-something entrepreneur look is in, but in case it’s too hard for you to even fathom where to find your solid color shirts and hoodies, H&M and the Zuck have made it super simple. Though, does anyone want to actually say they’re wearing Mark Zuckerberg? The concept is there, but the jokes weren’t that funny and the self-awareness level of “OMG LOOK AT US WE MADE A FUNNY” was a little over the top on Timehop’s part. At first I thought Timehop had given me someone else’s history! Raise your hand if you have a folder full of cat GIFs and need a reliable storage solution. If you didn’t raise your hand just now, how do you even enjoy the internet? This is for people who are more into dogs than cats: We loved Dash, the robot that helps your kids learn to code, so we found this prank on it now being able to teach your pup to program adorable. There are a lot of logo refreshes that we wish were fake – thankfully, this one is. Have you decided who you’re selling Virgin Airlines to, Sir Branson? This Britain-based airline will send hipsters to all their favorite destinations: Williamsburg in Brooklyn, Palermo Soho in Buenos Aires, The Mission in San Francisco. They’ve even got quinoa salads and artisanal cheeses on board, and classless seating because yes to equality. Touché, Hipster Air. But if cabin classes are your thing, a kids-only one that separates them from the adults on Virgin Australia would be our idea of a good flight. It’s clear Hulu wants to jump in on the Netflix and Chill wagon but sorry, it’s just not the same. Plus, everyone knows people only hook up from being invited to watch stuff, not become involved in long lasting relationships. Get with the program, Hulu. Need I say more? Instant donuts at the tip of your fingers. Is it okay to store yeast in a 3D printer? Tired of waiting on SpaceX to come out with that darn Hyperloop already? Google Fiber‘s got your instant transportation needs covered. To read any comments on a Reddit r/technology thread today, you have to highlight it. Which isn’t hard if you just pressed CTRL+A, but it became pretty annoying when you’re just trying to read a maybe-real-but-probably-totally-fake Edward Snowden AMA. Sometimes, collaborating on a team document gets old. Box is making things a little more fun with a native Battle Notes game to take your frustrations out the healthy, non-HR violating way. And yes, it really works! Child labor is frickin’ hilarious! Did we miss your favorites? Share them in the comments below.